Looking for food and a fun time for the whole family? 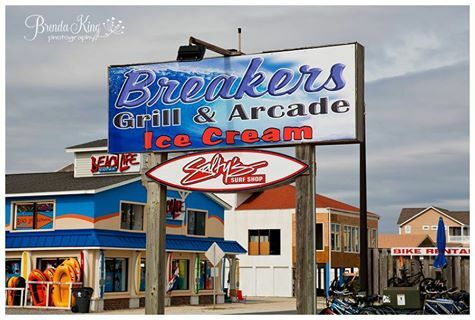 Then The Breakers Grill and Arcade and Ice Cream in Ocean Isle Beach may be just the ticket! Though The Breakers Grill and Arcade isn’t one of those giant ultra-modern arcades you find in most malls, it’s loaded with the latest video games and a surprising number of “old school” games such as pinball, ski-ball, and pool. Praised by many as having the best ice cream in Ocean Isle Beach, The Breakers Grill also offers specialty pizzas, subs, burgers, hot dogs, and salads. Located right next to Ocean Isle Beach Pier, The Breakers Grill and Arcade is the perfect Ocean Isle Beach, NC restaurant for beachgoers to take a break from the sun, grab a bite, and have a good time. Who doesn’t love ice cream? The Breakers Grill features Hershey’s ice cream, one of the best tasting brands in the country. With 45 flavors to choose from, there’s sure to be something everyone in the family will enjoy. For those who are lactose intolerant, they also have Italian ice in a variety of flavors. Want something more than a sweet treat? Their pizza is awesome! The Breakers offers six different pizzas, all 16 inches, and includes vegetarian pizza, the fully-loaded Breaker’s Special with hamburger, onions, sausage, pepperoni, banana and green peppers, mushrooms, and olives; and their Special White pizza is a create-it-yourself non-tomato pie with up to five toppings. If you’re not in the mood for pizza, The Breakers Grill also offers tasty foot-long subs including Philly steak, grilled chicken, Italian, and many more. If you still can’t decide, you can’t go wrong with a Nathan’s hot dog, a burger, mozzarella sticks, or a salad. Prices are typical for a boardwalk arcade, ranging from $2.50 for hot dogs, about $10 for subs, and $15 to $23 for pizza. The Breakers Grill and Arcade is located right at the Ocean Isle Beach Pier. Parking lot entrances are on either side of the traffic roundabout on 1st Street at the intersection of 1st and Causeway Drive. Though there are many unique Ocean Isle Beach, NC restaurants, The Breakers Grill and Arcade might be the most unique of all!